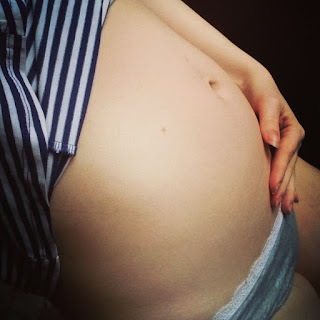 So, you probably noticed there was no post for week 13 and I kind of knew that was going to happen when they moved the pregnancy forward to my original due date as I lost 5 days to that. Regarding the appetite - most days I've been so full up I don't notice I haven't eaten a thing. It's been things like, one corn on the cob or watermelon or maybe a bowl of sugar free yoghurt with oat muesli. Not too exciting. The past two days I've wanted loads of sweets though (but only if they contained coconut!) But do you think I've gained any weight? Nope. Still 3-4 pounds down, no gain. Another issue is dizziness and fainting. I've fainted once in each pregnancy around 5 months but this time it's an all day occurrence. Every time I get up, no matter how slow, I get crazy dizzy. If my blood sugar is running low I feel faint straight away - and with the no eating problem you can understand how hard this thing is to balance correctly. And no doubt, lack of nutrients is what keeps the dizziness coming back over and over. I'm also bleeding again with pains everywhere, but the baby's heartbeat is still strong so I don't know why this whole thing is being so annoying. I have a private gender scan booked for Monday the 13th of July and we are definitely looking forward to it. And regarding our house situation - we should be getting our new house on the 10th of July, hopefully!